The second day of the Niagara Wine Week started with a visit to Malivoire Wine Company. My history with Malivoire is both good and bad. In the early 2000’s I had one brilliant visit which yielded ample reds and whites in the cellar to enjoy over the following years. Some 3 years later the return visit was lacking and I got a feeling of hit or miss with this Beamsville Bench producer. With that in the back of my mind I pulled into the gravel driveway with the familiar futuristic Winery up and to the right. If you have not visited this vineyard you need to, the principle building by itself is a beautiful piece of work, with the operating winery right above the tasting room. The time and effort put into the building is visible and you are blessed with a gorgeous area to sip and learn about Martin Malivoire’s vision. Planted originally in 1997, the Moira Vineyard is the original plot of the winery. Some six hectares dedicated to only Pinot Noir and Chardonnay, the burgundy principles, it often finds itself producing the best wines that Malivoire has to offer. This particular wine would probably be considered their flagship offering, which does lead me to state this. The object of the Niagara Wine Week was not to necessarily taste and review only the wineries best, but to also get a chance to taste the one offs or special wines you simply would not know of or hear of. This does not mean that Eric Nixon, the Presentation and Promotions Manager, failed at this task, it further proves how much the winery loves this wine. 2007 was a hot year, and unlike 2006 which was hot but finished wet and cold, ’07 has turned out to be an ideal vintage year from Stoney Creek to Niagara on the Lake. The 07′ vintage reds should prove to be one of the all-time best out of Niagara and most vineyard’s flagship reds are worthy of the money they are asking. This Moira Vineyard Pinot Noir shows many of the characteristics of this fantastic year. It is both bold and complex. So instead of babbling on about either the Beamsville Bench or the vineyard, click on the links and immerse yourself some more, or continue below and read the review of this Pinot. We did not decant this wine, sometimes with Pinot’s I choose to let them play as they are, other times I feel that some aeration is deserved and the time is taken. This may seem sacrilegious to some, but everyone’s tastes, senses and ideas are different and I am not sold one way or another. To decant for 5 minutes should not be life or death for a wine. And alas, I do not think it made a tremendous amount here either. The wine had a nice inky colour into the glass and red fruit came rushing at my nostril with primarily black cherry and a hint or two of spice in the way of cinnamon to follow. Upon the first sip you will notice this is not a mellow laid back Pinot that can often times pass for the Niagara region’s version of Burgundy’s best. This wine is instantly in your face and had good strong tannins that, with solid fruit, indicate a nice maturing/cellaring in its future. A first guess would say 3 to 5 years will further add to the structure of the wine and may give even out its balance. Overall you will find a bold wine with strong red fruits and hints of spice and smoke. The tannins may lead some to find this wine overwhelming but more so if you consider it against the average Pinot from the region. This wine is strong and requires the right palate to truly appreciate it and at $59.95 a deep pocket book. The CWG Subjective Rating is 88 out of 100. 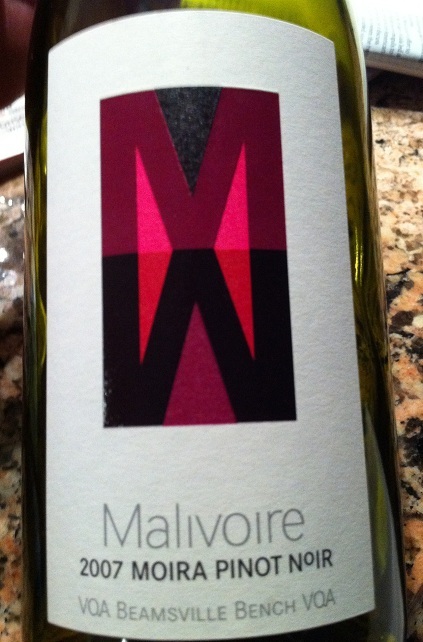 This entry was posted in Canadian, Wine and tagged canadian wine guy, malivoire, wine review. Bookmark the permalink.